These are easy to make but not so quick, they take about 2 hours with rising and everything, but they are worth it in my opinion. 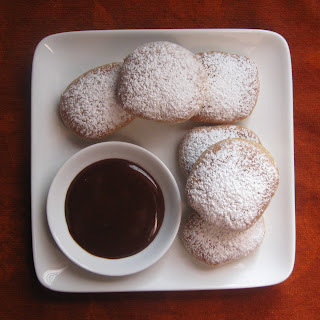 I'm a big fan of chocolate like I am of cinnamon and so there they both are in the doughnuts. This dough isn't going to be like your typical bread dough which is thick. This dough was soft to work with so it needs to be handled gently. It may seem to thin but don't add more flour unless you really to because it will work for you after it rises and doesn't take much flour on the surface to be able to roll out lightly. I made up the chocolate sauce because I thought it would be delicious to dip the doughnuts in and it takes less than two minutes to make. Just be careful not to let it overflow in the microwave and heat it just until hot then stir well and it will come out nice and smooth. 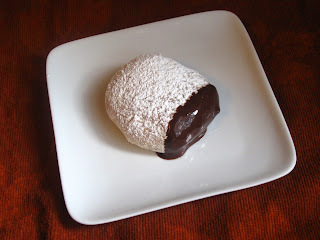 I was thinking it may be a lovely accompaniment to pound cake or to dip cookies in also! Happy Baking! In a small saucepan, heat milk over medium low heat until warm to the touch, then take off heat. Whisk in ½ teaspoon sugar, and yeast and let stand 5 minutes. In a small bowl, whisk together flour, cinnamon, baking soda, and salt. Pour yeast mixture into a stand mixer fitted with a dough hook. Add flour mixture, remaining sugar, and butter to mixer. Mix until ingredients are combined and form a ball, then continue to let the mixer kneed for 5 minutes. Cover bowl with a dish towel and let sit in a warm place for 40 minutes. On a lightly floured surface, roll dough out into a half-inch thick rectangle. Cut dough into 12 rectangles measuring approximately 1 by 2 inches. Line a baking sheet with parchment paper. Place doughnuts on baking sheet, cover with a dish towel, and let rest 20 minutes. Preheat oven to 400°F. Bake doughnuts until puffed and golden brown, about 12 minutes. Fill a shallow dish with confectioners' sugar. While still hot, roll doughnuts in sugar to coat. 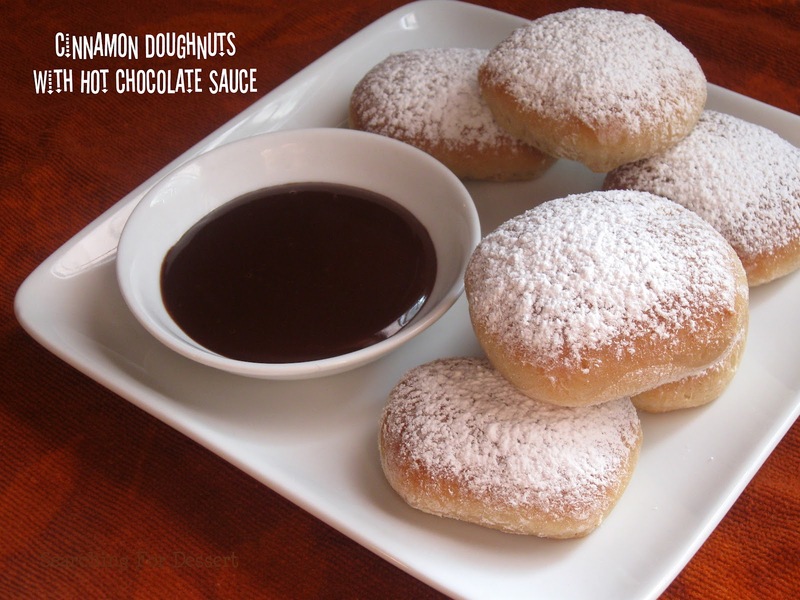 When ready to serve doughnuts, roll or dust them with extra sugar. Sauce: Stir together the cocoa, sugar, milk, and vanilla in a microwave safe bowl until well blended. Heat in microwave 20-35 seconds (watch carefully to make sure it doesn’t overflow). Stir, serve with doughnuts.